any fellow 3D owners out there with experience of adjusting/mapping of Athena fuel injection? 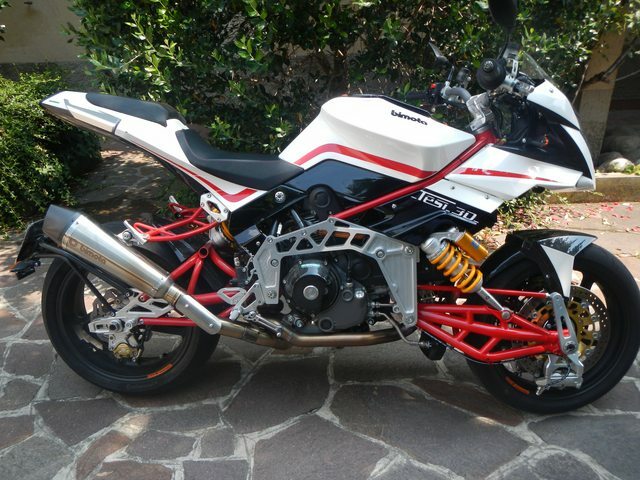 I havent got experience with the Athena ECU's used on the later bikes....Tesi 3D, DBX and DB10....my experience was that Bimota had not written the programmes for the bikes even up until they closed the factory....Is it over fueling? I presume you still have the original exhaust system on the bike? With a front catalytic converter "swelling" in the front header under the engine...and usually theres one in the twin branch cross piece behind the back of the engine...I decatted mine by buying cat free headers on my Db5R and DB6R direct from zard….it not only starts better but runs better as gases and unburnt fuel aren't trapped by the cats...which are a helical winding and quite restrictive...also I run baffle free end cans on both bikes...engine is the same on these bikes as on yours....no need to remap as the lambda sensors seem to take care of issues in the running...both of mine have ran cat free and baffle free for the last 2-3.000 miles a-piece without issue. I think Piso's 3D is a later one with 1100 EVO motor and Arrow exhaust with single cat like this. btw: is vort28-2 a re-incarnated version of vort28? You can't get rid of me that easily ! !